I see this as one of those books that will echo for generations to come, guiding everyone towards a stronger understanding and practice of Magic. A phenomenal work everyone should read no matter the level of skill. A true step forward in our Art! Over the years quite a few online magic companies with slogan to change the magic community but in reality what they are doing merely is not. All we have in the last decade were hundreds of custom printed decks, thousands of DVDs which most of them never remember what effect taught inside and tens of thousands instant downloads where many of us even do not want to know what it is about. Magic in mind is just like a life ring in the ocean of magic junk. Enough said. I wished that this book is available when I started more than a decade ago so that I would not spent time that I do not need to in searching what to learn and how to study magic. A must read for everyone, another winner from Vanishing Magic Inc.
Every starting magician should read this e-book also Strong Magic also a great accompany for this e-book since its all theoretical and very useful to professionals or beginners that are very in to magic not only as a hobby. Vanishing inc is definitely the website for magicians. I just open the pdf file...FANTASTIC!!! This is one of the greatest and most inspirational collection of essays ever! Do yourself a favour and download it. Now. What are you waiting for? Navigating one's way through the formidable back catalogue of writings on magic can be pretty daunting - so if someone would only put together a selective reader… and now they have! 'Magic in Mind' is a real boon, an absolute gem, and a remarkably generous endeavour - priceless, in many ways. You have no excuse! This is an amazing resource. It will make you think and even question the hows and whys to your approach and performance. Oh, and it's free so get it. You won't regret it. I can't believe this collection of essays is free. I wish my fifteen-year-old self could have read this. He wouldn't have dropped out of magic for lack of direction, understanding and confidence. 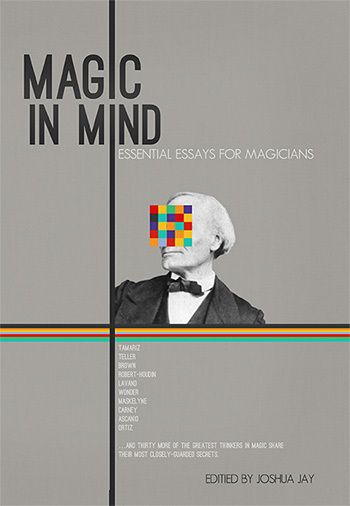 This collection contains everything you need to be aware of if you want to understand what performing magic is really all about. You will feel as if all those performers are there in the same room with you, giving you their advice, building on what others have said before. You will realize that you are not looking for answers. You are looking for questions. The way you answer those questions will shape who you will become. I'm 35 now and I don't know where my answers will take me. What matters is that the kid who loved magic finally has the thinking toys aka tools he needed to start his journey. Here is another historic addition to the contributions of great and generous magicians that I hope will stand the test of time. This is an incredible "gift" to the magic community from an incredible gentleman. Joshua...thank you for such an insightful and generous gift. Get it! This 555 page book is essential to magic.This knowledge is what separates magicians from :"someone who knows couple tricks". The book is divided into different chapters and contains collected essays from some of the most influential thinkers in magic of all time. There's something in here for all performers. I'm a mentalist and I've benefited greatly from every essay. This is a book you'll read and cherish and study for a lifetime. A lifetime worth of knowledge is here and all for the price of FREE!!!!!! Why don't you have it yet? I can not comprehend how all this amount of work done by Vanishing Inc is FREE? Maybe because they are not the authors of the content inside, but I can not be more thankful for giving this to the magic community free. Don´t think about it, just DOWNLOAD IT! This is a terrific book that is a must read for not only magicians but for all involved in the performing arts. I am a musician, music teacher by trade and I enjoy magic very much as well. There is so much carry over between the two art forms and within this book you will find so many things that will help you be better at all performing arts. Thanks so much for putting this together and offering it to the performing arts community. One thing I have noticed over the years is that people involved in the performing arts have a wonderful desire to share with others. This book is positive proof of that!